The number of outstanding shares of the Registrant’s Common Stock and Class B Common Stock as of October 12, 2018 were 15,431,209 and 3,710,009, respectively. The aggregate market value of the voting stock of the Registrant held by non-affiliates as of February 23, 2018 (the last business day of the Registrant’s most recently completed second fiscal quarter), computed by reference to the closing sale price of such shares on such date, was approximately $2,422,512,285. The Registrant intends to file a Definitive Proxy Statement pursuant to Regulation 14A promulgated under the Securities Exchange Act of 1934, as amended, for its 2019 Annual Meeting of Shareholders within 120 days of the end of the fiscal year ended August 25, 2018. Portions of such Proxy Statement are incorporated by reference in Part III of this Annual Report on Form 10-K. This Annual Report on Form 10-K contains forward-looking statements within the meaning of Section 27A of the Securities Act of 1933, as amended, and Section 21E of the Securities Exchange Act of 1934, as amended. Our actual results could differ materially from those set forth in the forward-looking statements. Certain factors that might cause such a difference are discussed in “Management’s Discussion and Analysis of Financial Condition and Results of Operations”; “Safe Harbor for Forward Looking Statements” and “Risk Factors” included elsewhere in this Annual Report on Form 10-K.
UniFirst Corporation, a corporation organized under the laws of the Commonwealth of Massachusetts in 1950, together with its subsidiaries, hereunder referred to as “we”, “our”, the “Company”, or “UniFirst”, is one of the largest providers of workplace uniforms and protective work wear clothing in the United States. We design, manufacture, personalize, rent, clean, deliver, and sell a wide range of uniforms and protective clothing, including shirts, pants, jackets, coveralls, lab coats, smocks, aprons and specialized protective wear, such as flame resistant and high visibility garments. We also rent and sell industrial wiping products, floor mats, facility service products and other non-garment items, and provide restroom and cleaning supplies and first aid cabinet services and other safety supplies, to a variety of manufacturers, retailers and service companies. We serve businesses of all sizes in numerous industry categories. At certain specialized facilities, we also decontaminate and clean work clothes and other items that may have been exposed to radioactive materials and service special cleanroom protective wear and facilities. Our principal services include providing customers with uniforms and other non-garment items, picking up soiled uniforms or other items on a periodic basis (usually weekly), and delivering, at the same time, cleaned and processed items. We offer uniforms in a wide variety of styles, colors, sizes and fabrics and with personalized emblems selected by the customer. Our centralized services, specialized equipment and economies of scale generally allow us to be more cost effective in providing garment services than customers could be themselves, particularly those customers with high employee turnover rates. During the fiscal year ended August 25, 2018 ("fiscal 2018"), we manufactured approximately 71% of the garments we placed in service. These were primarily work pants and shirts manufactured at three of our plants located in San Luis Potosi, Mexico, one plant located in Managua, Nicaragua, as well as at subcontract manufacturers that we utilize to supplement our manufacturing capacity in periods of high demand. Because we design and manufacture a majority of our own uniforms and protective clothes, we can produce custom garment programs for our larger customers, offer a diverse range of such designs within our standard line of garments and better control the quality, price and speed at which we produce such garments. In addition, among our competitors, we believe we have the largest in-house digital image processing capability, allowing us to convert an image provided by a customer into customized, mass producible embroidered emblems, typically within two days. We provide our customers with personalized workplace uniforms and protective work clothing in a broad range of styles, colors, sizes and fabrics. Our uniform products include shirts, pants, jackets, coveralls, lab coats, smocks, aprons and specialized protective wear, such as flame resistant and high visibility garments. At certain specialized facilities, we also decontaminate and clean clothes and other items which may have been exposed to radioactive materials and service special cleanroom protective wear and facilities. We also offer non-garment items and services, such as industrial wiping products, floor mats, dry and wet mops, restroom and cleaning supplies and other textile products. We offer our customers a range of garment service options, including full-service rental programs in which garments are cleaned and serviced by us, lease programs in which garments are cleaned and maintained by individual employees and purchase programs to buy garments and related items directly. As part of our rental business, we pick up a customer’s soiled uniforms and/or other items on a periodic basis (usually weekly) and deliver back cleaned and processed replacement items. We believe our centralized services, specialized equipment and economies of scale generally allow us to be more cost effective in providing garment and related services than customers would be themselves, particularly those customers with high employee turnover rates. Our uniform program is intended not only to help our customers foster greater company identity, but to enhance their corporate image and improve employee safety, productivity and morale. We primarily serve our customers pursuant to written service contracts that range in duration from three to five years. We serve businesses of all sizes in numerous industry categories. During each of the past five years, no single customer in our Core Laundry Operations accounted for more than 5% of our revenues. Our typical customers include automobile service centers and dealers, delivery services, food and general merchandise retailers, food processors and service operations, light manufacturers, maintenance facilities, restaurants, service companies, soft and durable goods wholesalers, transportation companies, and others who require employee clothing for image, identification, protection or utility purposes. Among our largest customers of our conventional uniform rental business are divisions, units, regional operations or franchised agencies of major, nationally recognized organizations. With respect to our Specialty Garment segment, typical customers include government agencies, research and development laboratories, high technology companies and utilities operating nuclear reactors. We currently service over 300,000 customer locations in the United States, Canada and Europe from over 250 customer service, distribution and manufacturing facilities. We market our products and services to a diverse customer base and to prospects that range across virtually all industry segments. Marketing contact is made through print advertising, direct mail, publicity, trade shows, catalogs, telemarketing, multiple web sites and direct field sales representation. We have built and maintain an extensive, proprietary database of prescreened and qualified business prospects that have been sourced from our various promotional initiatives, including mailers, web site contacts, advertising responses, sales calls and lists purchased from third-party providers. These prospect records serve as a primary targeting resource for our professional sales organization and are constantly updated, expanded and maintained by an in-house team of specialist database qualifiers and managers. To aid in the effective marketing of products and services, we supply sales representatives with an extensive selection of sales aids, brochures, presentation materials and vertical market communications tools. We also provide representatives with detailed on-line profiles of high opportunity markets to educate them to the typical issues, needs and concerns of those markets. This helps establish credibility and aids their ability to deliver value-based solutions. We employ a large team of trained professional sales representatives whose sole function is to market our services to potential customers and develop new accounts. While most of our sales representatives are capable of presenting a full range of service solutions, some are dedicated to developing business for a limited range of products and services or have a specific market focus. For example, in select geographic markets we employ teams of dedicated facility services sales representatives who focus exclusively on developing business for our floor care, restroom and related service programs. We employ specialist executive-level salespeople in our National Account Organization—some who specialize in rental programs and some who specialize in direct sale programs—to target the very largest national companies with known uniform and/or facility services program needs. We believe that effective customer service is the most important element in developing and maintaining our market position. Our commitment to service excellence is reflected throughout our organization. Our route sales representatives are the first line of continuing customer contact, who are supported by local customer service representatives, local service management staff and local operations management leaders, all of whom are focused on addressing the ongoing needs of customers, constantly delivering high-value service and pursuing total customer satisfaction. Our proprietary information systems and our support service center enable us to respond to customer inquiries or issues within 24 hours, and our service personnel are specially trained to handle the daily contact work necessary to effectively manage customer relations. We measure the speed and accuracy of our customer service efforts on a weekly basis and, through our “Customers for Life’’ program, we continuously survey, record and report satisfaction levels as a means of evaluating current performance and highlighting areas for improvement. The uniform rental and sales industry is highly competitive. The principal methods of competition in the industry are the quality of products, the quality of service and price. Our principal competitors include Cintas Corporation and Aramark Corporation. The remainder of the market, however, is divided among more than 600 smaller businesses, many of which serve one or a limited number of markets or geographic service areas. In addition to our traditional rental competitors, we may increasingly compete in the future with businesses that focus on selling uniforms and other related items. We also compete with industry competitors for acquisitions. We manufactured approximately 71% of all garments which we placed in service during fiscal 2018. These garments were primarily work pants and shirts manufactured at three of our plants located in San Luis Potosi, Mexico, one plant located in Managua, Nicaragua, as well as at subcontract manufacturers that we utilize to supplement our manufacturing capacity in periods of high demand. The balance of the garments used in our programs are purchased from a variety of industry suppliers. While we currently acquire the raw materials with which we produce our garments from a limited number of suppliers, we believe that such materials are readily available from other sources. To date, we have experienced no significant difficulty in obtaining any of our raw materials or supplies. Currently, we also manufacture approximately 96% of the mats we place in service at our plant in Cave City, Arkansas. As of August 25, 2018, we employed approximately 14,000 persons, and approximately 1% of our United States employees are represented by a union pursuant to a collective bargaining agreement. We consider our employee relations to be good. Steven S. Sintros joined our Company in 2004. Mr. Sintros has served as our President and Chief Executive Officer and a Director since July 2017. He has overall responsibility for management of our Company. He previously served as our Chief Financial Officer from January 2009 until January 2018. Mr. Sintros served as a Finance Manager in 2004 and Corporate Controller from 2005 until January 2009. Shane O’Connor joined our Company in 2005. Mr. O’Connor has served as our Senior Vice President and Chief Financial Officer since January 2018. He has primary responsibility for overseeing the financial functions of our Company, as well as our information systems department. Mr. O’Connor previously served as our Corporate Controller from 2009 to 2016. In 2016, he left the Company to take the role of Senior Vice President and Chief Financial Officer at Unidine Corporation, a leader in dining management services, and he then rejoined our Company in January 2018. Cynthia Croatti joined our Company in 1980. Ms. Croatti has served as Director since 1995, Treasurer since 1982 and Executive Vice President since 2001. In addition, she has primary responsibility for overseeing the human resources and purchasing functions of our Company. David A. DiFillippo joined our Company in 1979. Mr. DiFillippo has served as Senior Vice President, Operations since 2002 and has primary responsibility for overseeing the operations of certain regions in the United States and Canada. From 2000 through 2002, Mr. DiFillippo served as Vice President, Central Rental Group and, prior to 2000, he served as a Regional General Manager. David M. Katz joined our Company in 2009. Mr. Katz is a Senior Vice President and has primary responsibility for overseeing the sales and marketing functions of our Company. Prior to joining our Company, Mr. Katz worked for DHL Express where he served as the Northeast Vice President of Field Sales from 2003 to 2007, the Northeast Vice President of National Account Sales from 2007 to 2008 and the Senior Vice President and General Manager of the Northeast from 2008 until 2009. 2012 through 2015, he served as Senior Vice President, Service; from 2002 through 2012, he served as Vice President, Central Rental Group; and prior to 2002, he held various operating positions within the Company. William M. Ross joined our Company in 1989. Mr. Ross became Senior Vice President, Operations in 2016 and has primary responsibility for overseeing specified regions in the United States. From 2002 to 2016, Mr. Ross served as Regional Vice President of the Company. Prior to 2002, Mr. Ross held several sales and operations management positions at the Company. Michael A. Croatti is the nephew of Cynthia Croatti. We, like our competitors, are subject to various federal, state and local laws and regulations governing, among other things, air emissions, wastewater discharges, and the generation, handling, storage, transportation, treatment and disposal of hazardous wastes and other substances. In particular, industrial laundries currently use and must dispose of detergent waste water and other residues, and, in the past, used perchloroethylene and other dry cleaning solvents. We are attentive to the environmental concerns surrounding the disposal of these materials and have through the years taken measures to avoid their improper disposal. Over the years, we have settled, or contributed to the settlement of, actions or claims brought against us relating to the disposal of hazardous materials and there can be no assurance that we will not have to expend material amounts to remediate the consequences of any such disposal in the future. Further, under environmental laws, an owner or lessee of real estate may be liable for the costs of removal or remediation of certain hazardous or toxic substances located on, or in, or emanating from such property, as well as related costs of investigation and property damage. Such laws often impose liability without regard to whether the owner or lessee knew of, or was responsible for the presence of such hazardous or toxic substances. There can be no assurance that acquired or leased locations have been operated in compliance with environmental laws and regulations or that future uses or conditions will not result in the imposition of liability upon us under such laws or expose us to third-party actions such as tort suits. We continue to address environmental conditions under terms of consent orders negotiated with the applicable environmental authorities or otherwise with respect to sites located in, or related to, Woburn, Massachusetts, Somerville, Massachusetts, Springfield, Massachusetts, Uvalde, Texas, Stockton, California, two sites related to former operations in Williamstown, Vermont, as well as sites located in Goldsboro, North Carolina, Wilmington, North Carolina, and Landover, Maryland. For additional discussion refer to “Management’s Discussion and Analysis of Financial Condition and Results of Operations” and the risk factors set forth in this Annual Report on Form 10-K.
Our nuclear garment decontamination facilities in the United States are licensed by the Nuclear Regulatory Commission, or in certain cases, by the applicable state agency, and are subject to regulation by federal, state and local authorities. We also have nuclear garment decontamination facilities in the United Kingdom and the Netherlands. These facilities are licensed and regulated by the respective country’s applicable federal agency. In the past, scrutiny and regulation of nuclear facilities and related services have resulted in the suspension of operations at certain nuclear facilities served by us or disruptions in our ability to service such facilities. There can be no assurance that such scrutiny and regulation will not lead to the shut-down of such facilities or otherwise cause material disruptions in our garment decontamination business. We make available free of charge our Proxy Statement, Annual Report on Form 10-K, Quarterly Reports on Form 10-Q, Current Reports on Form 8-K, including exhibits and any amendments to those reports, as soon as reasonably practicable after we electronically file such material with, or furnish it to, the Securities and Exchange Commission. These reports are available on our website at www.unifirst.com. In addition, you may request a copy of our filings, excluding exhibits, by contacting our Investor Relations group at (978) 658-8888 or at UniFirst Corporation, 68 Jonspin Road, Wilmington, MA 01887. Information included on our website is not deemed to be incorporated into this Annual Report on Form 10-K or the documents incorporated by reference into this Annual Report on Form 10-K. The statements in this section, as well as statements described elsewhere in this Annual Report on Form 10-K, or in other SEC filings, describe risks that could materially and adversely affect our business, financial condition and results of operations and the trading price of our securities. These risks are not the only risks that we face. Our business, financial condition and results of operations could also be materially affected by additional factors that are not presently known to us or that we currently consider to be immaterial to our operations. This Annual Report on Form 10-K and any documents incorporated by reference may contain forward looking statements within the meaning of the federal securities laws. Forward looking statements contained in this Annual Report on Form 10-K and any documents incorporated by reference are subject to the safe harbor created by the Private Securities Litigation Reform Act of 1995. Forward looking statements may be identified by words such as “estimates,” “anticipates,” “projects,” “plans,” “expects,” “intends,” “believes,” “seeks,” “could,” “should,” “may,” “will,” “strategy,” “objective,” “assume,” or the negative versions thereof, and similar expressions and by the context in which they are used. Such forward looking statements are based upon our current expectations and speak only as of the date made. Such statements are highly dependent upon a variety of risks, uncertainties and other important factors that could cause actual results to differ materially from those reflected in such forward looking statements. Such factors include, but are not limited to, the performance and success of our Chief Executive Officer, uncertainties caused by adverse economic conditions and their impact on our customers’ businesses and workforce levels, uncertainties regarding our ability to consummate and successfully integrate acquired businesses, our ability to maintain and grow Arrow Uniform’s customer base and enhance its operating margins, uncertainties regarding any existing or newly-discovered expenses and liabilities related to environmental compliance and remediation, any adverse outcome of pending or future contingencies or claims, our ability to compete successfully without any significant degradation in our margin rates, seasonal and quarterly fluctuations in business levels, our ability to preserve positive labor relationships and avoid becoming the target of corporate labor unionization campaigns that could disrupt our business, the effect of currency fluctuations on our results of operations and financial condition, our dependence on third parties to supply us with raw materials, any loss of key management or other personnel, increased costs as a result of any changes in federal or state laws, rules and regulations or governmental interpretation of such laws, rules and regulations, uncertainties regarding the impact of the recently passed U.S. tax reform on our business, results of operations and financial condition, uncertainties regarding the price levels of natural gas, electricity, fuel and labor, the negative effect on our business from sharply depressed oil and natural gas prices, the continuing increase in domestic healthcare costs, including the impact of the Affordable Care Act, our ability to retain and grow our customer base, demand and prices for our products and services, fluctuations in our Specialty Garments business, instability in Mexico and Nicaragua where our principal garment manufacturing plants are located, our ability to properly and efficiently design, construct, implement and operate a new customer relationship management (“CRM”) computer system, interruptions or failures of our information technology systems, including as a result of cyber-attacks, additional professional and internal costs necessary for compliance with any changes in Securities and Exchange Commission, New York Stock Exchange and accounting rules, strikes and unemployment levels, our efforts to evaluate and potentially reduce internal costs, economic and other developments associated with the war on terrorism and its impact on the economy, general economic conditions, our ability to successfully implement our business strategies and processes, including our capital allocation strategies and other factors described in “Item 1A. Risk Factors” and elsewhere in this Annual Report on Form 10-K. We undertake no obligation to update any forward looking statements to reflect events or circumstances arising after the date on which they are made. We face intense competition within our industry, which may adversely affect our results of operations and financial condition. The uniform rental and sales industry is highly competitive. The principal methods of competition in the industry are quality of products, quality of service and price. Our leading competitors include Cintas Corporation and Aramark Corporation. The remainder of the market, however, is divided among more than 600 smaller businesses, many of which serve one or a limited number of markets or geographic service areas. In addition to our traditional rental competitors, we may increasingly compete in the future with businesses that focus on selling uniforms and other related items, including single-use disposable garments for use in the nuclear industry. Increased competition may result in price reductions, reduced gross margins and loss of market share, any of which could have a material effect on our results of operations and financial condition. We also compete with industry competitors for acquisitions, which has the effect of increasing the price for acquisitions and reducing the number of acquisition candidates available to us. If we pay higher prices for businesses we acquire, our returns on investment and profitability may be reduced. Adverse economic and business conditions or geopolitical events may affect our customer base and negatively impact our sales and operating results. We supply uniform services to many industries that have been in the past, and may be in the future, subject to adverse economic and business conditions resulting in shifting employment levels, workforce reductions, changes in worker productivity, uncertainty regarding the impacts of rehiring and shifts to offshore manufacturing. In addition, geopolitical conflicts, calamities or other events may disrupt domestic and global business and financial markets and conditions. Any conditions or events that adversely affect our current customers or sales prospects may cause such customers or prospects to restrict expenditures, reduce workforces or even to cease to conduct their businesses. Any of these circumstances would have the effect of reducing the number of employees utilizing our uniform services, which adversely affects our sales and results of operations. The expenses we incur to comply with environmental regulations, including costs associated with potential environmental remediation, may prove to be significant and could have a material adverse effect on our results of operations and financial condition. We, like our competitors, are subject to various federal, state and local laws and regulations governing, among other things, air emissions, wastewater discharges, and the generation, handling, storage, transportation, treatment and disposal of hazardous wastes and other substances. In particular, industrial laundries currently use and must dispose of detergent waste water and other residues, and, in the past, used perchloroethylene and other dry cleaning solvents. We are attentive to the environmental concerns surrounding the disposal of these materials and have, through the years, taken measures to avoid their improper disposal. Over the years, we have settled, or contributed to the settlement of, actions or claims brought against us relating to the disposal of hazardous materials and there can be no assurance that we will not have to expend material amounts to remediate the consequences of any such disposal in the future. Further, under environmental laws, an owner or lessee of real estate may be liable for the costs of removal or remediation of certain hazardous or toxic substances located on, or in, or emanating from such property, as well as related costs of investigation and property damage. Such laws often impose liability without regard to whether the owner or lessee knew of, or was responsible for the presence of such hazardous or toxic substances. There can be no assurance that acquired or leased locations have been operated in compliance with environmental laws and regulations or that future uses or conditions will not result in the imposition of liability upon us under such laws or expose us to third-party actions such as tort suits. We continue to address environmental conditions under terms of consent orders negotiated with the applicable environmental authorities or otherwise with respect to sites located in or related to Woburn, Massachusetts, Somerville, Massachusetts, Springfield, Massachusetts, Uvalde, Texas, Stockton, California, two sites related to former operations in Williamstown, Vermont, as well as sites located in Goldsboro, North Carolina, Wilmington, North Carolina, and Landover, Maryland. We have accrued certain costs related to the sites described above as it has been determined that the costs are probable and can be reasonably estimated. We have potential exposure related to a parcel of land (the “Central Area”) related to the Woburn, Massachusetts site cited above. Currently, the consent decree for the Woburn site does not define or require any remediation work in the Central Area. The United States Environmental Protection Agency (the “EPA”) has provided us and other signatories to the consent decree with comments on the design and implementation of groundwater and soil remedies at the Woburn site and investigation of environmental conditions in the Central Area. We, and other signatories, have implemented and proposed to do additional work at the Woburn site but many of EPA’s comments remain to be resolved. We have accrued costs to perform certain work responsive to EPA’s comments. We have implemented mitigation measures and continue to monitor environmental conditions at the Somerville, Massachusetts site. In addition, we have received demands from the local transit authority for reimbursement of certain costs associated with its construction of a new municipal transit station in the area of the Somerville site. This station is part of a planned extension of the transit system. We have reserved for costs in connection with this matter; however, in light of the uncertainties associated with this matter, these costs and the related reserve may change. We have also received notice that the Massachusetts Department of Environmental Protection is conducting an audit of the Company’s investigation and remediation work with respect to the Somerville site. On a quarterly basis, we assess each of our environmental sites to determine whether the costs of investigation and remediation of environmental conditions are probable and can be reasonably estimated as well as the adequacy of our accruals with respect to such costs. There can be no assurance that our accruals with respect to our environmental sites will be sufficient or that the costs of remediation and investigation will not substantially exceed our accruals as new facts, circumstances or estimates arise. respective country’s applicable federal agency. In the past, scrutiny and regulation of nuclear facilities and related services have resulted in the suspension of operations at certain nuclear facilities served by us or disruptions in our ability to service such facilities. There can be no assurance that such scrutiny and regulation will not lead to the shut-down of such facilities or otherwise cause material disruptions in our garment decontamination business. In addition, our nuclear garment decontamination operations are subject to asset retirement obligations related to the decommissioning of our nuclear laundry facilities. We recognize as a liability the present value of the estimated future costs to decommission these facilities. The estimated liability is based on historical experience in decommissioning nuclear laundry facilities, estimated useful lives of the underlying assets, external vendor estimates as to the cost to decommission these assets in the future, and federal and state regulatory requirements. No assurances can be given that these accruals will be sufficient or that the costs of such decommissioning will not substantially exceed such accruals, as our facts, circumstances or estimates change, including changes in the Company’s estimated useful lives of the underlying assets, estimated dates of decommissioning, changes in decommissioning costs, changes in federal or state regulatory guidance on the decommissioning of such facilities, or other changes in estimates. In addition to contingencies and claims relating to environmental compliance matters, we may from time to time be subject to legal proceedings and claims related to our business operations which may adversely affect our financial condition and operating results. In addition to contingencies and claims relating to environmental compliance matters, we are subject from time to time to legal proceedings and claims arising from the conduct of our business operations, including personal injury claims, customer contract matters and employment claims. Certain of these claims are typically not covered by our available insurance. In addition, claims occasionally result in significant investigation and litigation expenses and, if successful, may result in material losses to us. Certain claims may also result in significant adverse publicity against us. As a consequence, successful claims against us not covered by our available insurance coverage, or the impact of adverse publicity against us, could have a material adverse effect on our business, financial condition and results of operation. Our failure to implement successfully our acquisition strategy and to grow our business could adversely affect our ability to increase our revenues and could negatively impact our profitability. As part of our growth strategy, we intend to continue to actively pursue additional acquisition opportunities. However, as discussed above, we compete with others within our industry for suitable acquisition candidates. This competition may increase the price for acquisitions and reduce the number of acquisition candidates available to us. As a result, our ability to acquire businesses in the future, and to acquire such businesses on favorable terms, may be limited. Even if we are able to acquire businesses on favorable terms, managing growth through acquisition is a difficult process that includes integration and training of personnel, combining plant and operating procedures and additional matters related to the integration of acquired businesses within our existing organization. Unanticipated issues related to integration may result in additional expense or in disruption to our operations, either of which could negatively impact our ability to achieve anticipated benefits. While we believe we will be able to fully integrate acquired businesses, we can give no assurance that we will be successful in this regard. Growth of our business will likely require us to increase our work force, the scope of our operating and financial systems and the geographic area of our operations. We believe this growth will increase our operating complexity and the level of responsibility for both existing and new management personnel. Managing and sustaining our growth and expansion may require substantial enhancements to our operational and financial systems and controls, as well as additional administrative, operational and financial resources. There can be no assurance that we will be able to manage our expanding operations successfully, that any acquired business will perform as we expect, or that we will be able to maintain or accelerate our growth, and any failure to do so could have an adverse effect on our results of operations and financial condition. In order to finance such acquisitions, we may need to obtain additional funds either through public or private financings, including bank and other secured and unsecured borrowings and the issuance of debt or equity securities. There can be no assurance that such financings would be available to us on reasonable terms or that any future issuances of securities in connection with acquisitions will not be dilutive to our shareholders. If we are unable to preserve positive labor relationships or become the target of corporate labor unionization campaigns, the resulting labor unrest could disrupt our business by impairing our ability to produce and deliver our products. good, we cannot assure you that we will not experience pressure from labor unions or become the target of campaigns similar to those faced by our competitors. The potential for unionization could increase if the United States Congress passes federal “card check” legislation in the future. If we do encounter pressure from labor unions, including any labor unions in connection with our acquisitions of other businesses, any resulting labor unrest could disrupt our business by impairing our ability to produce and deliver our products. In addition, significant union representation would require us to negotiate wages, salaries, benefits and other terms with many of our employees collectively and could adversely affect our results of operations by increasing our labor costs or otherwise restricting our ability to maximize the efficiency of our operations. We may incur unexpected cost increases due to rising healthcare costs, the Affordable Care Act and other labor costs. The cost of healthcare that we provide to our employees has grown over the last few years at a rate in excess of our revenue growth and, as a result, has negatively impacted our operating results. Moreover, it is generally expected that healthcare costs in the United States will increase over the coming years at rates in excess of inflation. As a result of these factors, and depending on the effect of any modifications we have made including as a result of the Affordable Care Act, and may make in the future, to our employee healthcare plans and enrollment levels in those plans, we expect that our future operating results will continue to be further adversely impacted by increasing healthcare costs. Federal, state and municipal governments are mandating increases to minimum wage and other employee benefits. In addition, we face wage pressure as the result of a low unemployment environment. We have raised, and expect to continue to raise, our wage rates and benefits to reflect these changes, which has the effect of increasing our labor costs, which in turn adversely affects our results of operation and financial condition. Our failure to comply with these regulatory requirements would expose us to applicable penalties and increase the likelihood that we would be subject to unionization campaigns. Further mandates would require additional increases to our labor costs and adversely affect our operating margin. Our failure to retain our current customers, renew our existing customer contracts and enter into customer contracts with new customers could adversely affect our business, results of operations and financial condition. Our success depends on our ability to retain our current customers, renew our existing customer contracts and obtain new customers. Our ability to do so generally depends on a variety of factors, including the quality, price and responsiveness of our services, as well as our ability to market these services effectively and to differentiate ourselves from our competitors. In addition, renewal rates and our ability to obtain new customers are generally adversely affected by difficult economic and business conditions. We cannot assure you that we will be able to obtain new customers, renew existing customer contracts at the same or higher rates or that our current customers will not turn to competitors, cease operations, elect to self-operate or terminate contracts with us. Our failure to renew a significant number of our existing contracts would have an adverse effect on our results of operations and financial condition and failure to obtain new customers could have an adverse effect on our growth and results of operations. Increases in fuel and energy costs could adversely affect our operating costs. The price of fuel and energy needed to run our vehicles and equipment is unpredictable and fluctuates based on events outside our control, including geopolitical developments, supply and demand for oil and gas, actions by OPEC and other oil and gas producers, war and unrest in oil producing countries, regional production patterns, limits on refining capacities, natural disasters and environmental concerns. Any increase in fuel and energy costs could adversely affect our operating costs. As a result of our significant presence in energy producing regions, a prolonged drop in energy prices has in the past, and may in the future, negatively impact our financial results. we believe that significant decreases in oil and natural gas prices would have an overall negative impact on our results due to cutbacks by our customers both in, and dependent upon, the oil and natural gas industries, which would outweigh the benefits in our operating costs from lower energy costs. Fluctuations in the nuclear portion of our Specialty Garments segment, including the loss of key customers or a significant reduction in our business derived from key customers, could disproportionately impact our revenue and net income and create volatility in the price of our Common Stock. Our nuclear decontamination business is affected by shut-downs, outages and clean-ups of the nuclear facilities we service. We are not able to control or predict with certainty when such shut-downs, outages and clean-ups will occur. In addition, our nuclear decontamination business tends to generate more revenue in the first and third fiscal quarters, which is when nuclear power plants typically schedule their plant outages and refuelings and thereby increase nuclear garment utilization. Moreover, a significant percentage of this segment’s revenues are generated from a limited number of nuclear power plant operator customers. This concentration subjects this business to significant risks and may result in greater volatility in this segment’s results of operations. Fluctuations in our nuclear decontamination business, including the loss of key customers of our Specialty Garments business, or a significant reduction in our business derived from such key customers, could materially adversely affect our results of operations and financial condition. Our international business results are influenced by currency fluctuations and other risks that could have an adverse effect on our results of operations and financial condition. A portion of our sales is derived from international markets. Revenue denominated in currencies other than the U.S. dollar represented approximately 8.1%, 7.4% and 7.9% of total consolidated revenues for fiscal 2018, fiscal year ended August 26, 2017 ("fiscal 2017") and fiscal year ended August 27, 2016 ("fiscal 2016"), respectively. The operating results of our international subsidiaries are translated into U.S. dollars and such results are affected by movements in foreign currencies relative to the U.S. dollar. The strength of the U.S. dollar has generally increased recently as compared to other currencies, which has had, and may continue to have, an adverse effect on our operating results as reported in U.S. dollars. In addition, a weaker Canadian dollar increases the costs to our Canadian operations of merchandise and other operational inputs that are sourced from outside Canada, which has the effect of reducing the operating margins of our Canadian business if we are unable to recover these additional costs through price adjustments with our Canadian customers. Our international operations are also subject to other risks, including the requirement to comply with changing and conflicting national and local regulatory requirements; potential difficulties in staffing and labor disputes; managing and obtaining support and distribution for local operations; credit risk or financial condition of local customers; potential imposition of restrictions on investments; potentially adverse tax consequences, including imposition or increase of withholding and other taxes on remittances and other payments by subsidiaries; foreign exchange controls; and local political and social conditions. In addition, U.S. and foreign trade policies and tariffs and other impositions on imported goods may have a negative impact on our business. There can be no assurance that the foregoing factors will not have an adverse effect on our international operations or on our consolidated financial condition and results of operations. We own and operate manufacturing facilities in Mexico. Violence, crime and instability in Mexico has had, and may continue to have, an adverse effect on our operations, including the hijacking of our trucks and the implementation of security measures to protect our employees. We are not insured against such criminal attacks and there can be no assurance that losses that could result from an attack on our trucks or our personnel would not have a material adverse effect on our business, results of operations and financial condition. Operations in developing nations present several additional risks, including greater fluctuation in currencies relative to the U.S. dollar, economic and governmental instability, civil disturbances, volatility in gross domestic production, Foreign Corrupt Practice Act compliance issues and nationalization and expropriation of private assets, which could have a material adverse effect on our business, results of operations and financial condition. Adverse global financial and economic conditions may result in impairment of our goodwill and intangibles. goodwill or one or more of our acquired intangibles become impaired, our consolidated earnings and net worth may be materially adversely affected. Our failure to properly and efficiently design, construct, implement and operate a new customer relationship management (CRM) computer system could materially disrupt our operations, adversely impact the servicing of our customers and have a material adverse effect on our financial performance. We have been working on a new CRM systems project to modernize and improve the CRM system's current capabilities. The new system is intended to combine enterprise resource planning (“ERP”) solutions and custom-built applications to address, among other areas, account management, billing and customer service. The new system is also intended to improve functionality and information flow and increase automation in servicing our customers. Our previous CRM systems project did not result in the successful implementation of a CRM system. The failure to properly, efficiently and economically complete and operate a new system on a timely basis or at all could materially disrupt our operations, adversely impact the servicing of our customers and have a material adverse effect on our financial results. If our information technology systems suffer interruptions or failures, including as a result of cyber-attacks, our business operations could be disrupted. Our information technology systems serve an important role in the efficient operation of our business. The failure of these information technology systems to perform as we anticipate could disrupt our business and negatively impact our results of operations. In addition, our information technology systems could be damaged or cease to function properly due to any number of causes, such as catastrophic events, power outages, security breaches, computer viruses or cyber-based attacks. While we have contingency plans in place to prevent or mitigate the impact of these events, if such events were to occur and our disaster recovery plans do not effectively address the issues on a timely basis, we could suffer interruptions in our ability to manage our operations and service our customers, and we may be required to make a significant investment to fix or replace our information technology systems, each of which may have a material adverse effect on our business and financial results. In addition, if customer or our proprietary information is compromised by a security breach or cyber-attack, it could have a material adverse effect on our business. We are subject to numerous laws and regulations in the United States and internationally designed to protect the information of clients, customers, employees, and other third parties that we collect and maintain. These laws and regulations are increasing in complexity and number. If we fail to comply with such laws or regulations, it could have an adverse effect on our business. Failure to comply with state and federal regulations to which we are subject may result in penalties or costs that could have a material adverse effect on our business. Our business is subject to various state and federal regulations, including employment laws and regulations, minimum wage requirements, overtime requirements, working condition requirements, citizenship requirements, healthcare insurance mandates, data protection requirements and other laws and regulations. Any appreciable increase in the statutory minimum wage rate, income or overtime pay, costs of complying with healthcare insurance mandates, changes in OSHA requirements, changes in environmental compliance requirements, or changes to immigration laws and citizenship requirements would likely result in an increase in our labor costs and/or contribute to a shortage of available labor and such cost increase or labor shortage, or the penalties for failing to comply with such statutory minimums or regulations, could have an adverse effect on our business, liquidity and results of operations. Our business may be subject to seasonal and quarterly fluctuations. Historically, our revenues and operating results have varied from quarter to quarter and are expected to continue to fluctuate in the future. In addition, our operating results historically have been seasonally lower during the second and fourth fiscal quarters than during the other quarters of the fiscal year. We incur various costs in integrating or establishing newly acquired businesses or start-up operations, and the profitability of a new location is generally expected to be lower in the initial period of its operation than in subsequent periods. Start-up operations in particular lack the support of an existing customer base and require a significantly longer period to develop sales opportunities and meet targeted operating results. These factors, among others, may cause our results of operations in some future quarters to be below the expectations of securities analysts and investors, which could have an adverse effect on the market price of our Common Stock. Our success is largely dependent on the skills, experience and efforts of our senior management, including our President and Chief Executive Officer, and certain other key personnel. If, for any reason, one or more senior executives or key personnel were not to remain active in our Company, our results of operations could be adversely affected. Our future success also depends upon our ability to attract and retain key employees. There is competition in the market for the services of such qualified personnel and hourly workers and our failure to attract and retain such personnel or workers could adversely affect our results of operations. We depend on third parties to supply us with raw materials and our results of operations could be adversely affected if we are unable to obtain adequate raw materials in a timely manner. We manufactured approximately 71% of all garments which we placed in service during fiscal 2018. These were primarily work pants and shirts manufactured at three of our plants located in San Luis Potosi, Mexico, one plant located in Managua, Nicaragua, as well as at subcontract manufacturers that we utilize to supplement our manufacturing capacity in periods of high demand. The balance of the garments used in our programs are purchased from a variety of industry suppliers. While we currently acquire the raw materials with which we produce our garments from a limited number of suppliers, we believe that such materials are readily available from other sources. To date, we have experienced no significant difficulty in obtaining any of our raw materials or supplies. However, if we were to experience difficulty obtaining any of our raw materials from such suppliers and were unable to obtain new materials or supplies from other industry suppliers, or if the cost of obtaining such materials or supplies were to increase, it could adversely affect our results of operations. Unexpected events, including, without limitation, fires at facilities, natural disasters, such as hurricanes, earthquakes and tornados, public health emergencies, war or terrorist activities, unplanned utility outages, supply disruptions, failure of equipment or information systems, temporary or long-term disruption of our computer systems, or changes in laws and/or regulations impacting our business, could adversely affect our operating results. These events could result in disruption of customer service, physical damage to one or more key operating facilities, the temporary closure of one or more key operating facilities or the temporary disruption of information systems. In addition, the destruction or temporary loss of our distribution facility in Owensboro, Kentucky would have a material adverse effect on our operations and financial results. Changes in or new interpretations of the governmental regulatory framework may affect our contract terms and may reduce our sales or profits. A portion of our total consolidated revenues is derived from business with U.S. federal, state and local governments and agencies. Changes or new interpretations in, or changes in the enforcement of, the statutory or regulatory framework applicable to services provided under governmental contracts or bidding procedures could result in fewer new contracts or contract renewals, modifications to the methods we apply to price government contracts or in contract terms of shorter duration than we have historically experienced, any of which could result in lower sales or profits than we have historically achieved, which could have an adverse effect on our results of operations. The price of our Common Stock may be highly volatile, which could result in significant price declines. The price of our Common Stock may experience significant volatility. Such volatility may be caused by fluctuations in our operating results, changes in earnings estimated by investment analysts, the number of shares of our Common Stock traded each day, the degree of success we achieve in implementing our business and growth strategies, changes in business or regulatory conditions affecting us, our customers or our competitors and other factors. In addition, the New York Stock Exchange historically has experienced extreme price and volume fluctuations that often have been unrelated to, or disproportionate to, the operating performance of its listed companies. These fluctuations, as well as general economic, political and market conditions, may adversely affect the market price of our Common Stock. We are controlled by our principal shareholders, and our other shareholders may be unable to affect the outcome of shareholder voting. As of October 12, 2018, to the Company’s knowledge, the members of the Croatti family owned, directly or indirectly, in the aggregate approximately 228,276 shares of our Common Stock and approximately 3,710,009 shares of our Class B Common Stock, which represents approximately 20.6% of the aggregate number of outstanding shares of our Common Stock and Class B Common Stock, but approximately 71.1% of the combined voting power of the outstanding shares of our Common Stock and Class B Common Stock. As a result, the members of the Croatti family, acting with other family members, could effectively control most matters requiring approval by our shareholders, including the election of a majority of the directors. While historically the members of the Croatti family have individually voted their respective shares of Class B Common Stock in the same manner, there is no contractual understanding requiring this and there is no assurance that the family members will continue to individually vote their shares of Class B Common Stock in the same manner. This voting control by the members of the Croatti family, together with certain provisions of our by-laws and articles of organization, could have the effect of delaying, deferring or preventing a change in control of our Company that would otherwise be beneficial to our public shareholders. If we are unable to accurately predict our future tax liabilities or become subject to increased levels of taxation or our tax contingencies are unfavorably resolved, our results of operations and financial condition could be adversely affected. On December 22, 2017, the tax legislation commonly known as the “Tax Cuts and Jobs Act” (the “Act”) was signed into law. The Act made significant changes to U.S. federal income tax laws, including a reduction of the corporate income tax rate from a top marginal rate of 35% to a flat rate of 21%. Certain provisions of the Act could have an adverse effect on our financial condition and results of operations. Such provisions include, but are not limited to, a one-time transition tax on earnings of certain foreign subsidiaries, new taxes on certain foreign sourced earnings and limitations on the deductibility of interest expense and executive compensation. The Act also imposes new limitations on the deduction of net operating losses and modifies or repeals other business deductions and credits. The overall impact of the Act on our business and financial condition is uncertain and may not become evident for some period of time. The interpretations of many provisions of the Act are unclear. We cannot predict when or to what extent any U.S. federal tax laws, regulations, interpretations, or rulings clarifying the Act will be issued or the impact of any such guidance on the Company. Certain key provisions of the Act that could impact us include, but are not limited to, international tax provisions that affect the overall tax rate applicable to income earned from non-U.S. operations and limitations on the deductibility of executive compensation. We have made reasonable estimates of the effects of the Act, but these estimates could change in future periods as we continue to analyze the effects of the Act. Other changes in tax laws or regulations in the jurisdictions in which we do business, including the United States or various states, could further increase our effective tax rate or impose new restrictions, costs or prohibitions on our current practices and reduce our net income and adversely affect our cash flows. In addition, we are also subject to tax audits in the United States and other jurisdictions in which we do business, including, but not limited to, various states as well as Canada and the Canadian provinces of Alberta, British Columbia, Ontario, Saskatchewan, Quebec and New Brunswick. These audits can be complicated and require several years to resolve. The final resolution of any such tax audit could result in an increase in our income tax liabilities. Although we believe that our current tax provisions are reasonable and appropriate, there can be no assurance that these items will be settled for the amounts accrued, that additional tax exposures will not be identified in the future or that additional tax reserves will not be necessary for any such exposures. Any increase in the amount of taxes we owe as a result of challenges to our tax filing positions could result in a material adverse effect on our business, results of operations and financial condition. As of August 25, 2018, we owned or leased approximately 261 facilities containing an aggregate of approximately 7.7 million square feet located in the United States, Canada, Mexico, Europe and Nicaragua. We owned 132 of these facilities, containing approximately 5.8 million square feet. These facilities include our 325,000 square foot Owensboro, Kentucky distribution center and almost all of our industrial laundry processing plants. We believe our industrial laundry facilities are among the most modern in the industry. We own substantially all of the machinery and equipment used in our operations. We believe that our facilities and our production, cleaning and decontamination equipment have been well maintained and are adequate for our present needs. We also own a fleet of approximately 3,900 delivery vans, trucks and other vehicles. From time to time, we are subject to legal proceedings and claims arising from the current conduct of our business operations, including personal injury, customer contract, employment claims and environmental matters as described in our Consolidated Financial Statements. We maintain insurance coverage providing indemnification against many of such claims, and we do not expect that we will sustain any material loss as a result thereof. In addition, we, like our competitors, are subject to various federal, state and local laws and regulations governing, among other things, air emissions, wastewater discharges, and the generation, handling, storage, transportation, treatment and disposal of hazardous wastes and other substances. In particular, industrial laundries currently use and must dispose of detergent waste water and other residues, and, in the past, used perchloroethylene and other dry cleaning solvents. Over the years, we have settled, or contributed to the settlement of, actions or claims brought against us relating to the disposal of hazardous materials and there can be no assurance that we will not have to expend material amounts to remediate the consequences of any such disposal in the future. Further, under environmental laws, an owner or lessee of real estate may be liable for the costs of removal or remediation of certain hazardous or toxic substances located on or in or emanating from such property, as well as related costs of investigation and property damage. Such laws often impose liability without regard to whether the owner or lessee knew of or was responsible for the presence of such hazardous or toxic substances. There can be no assurance that acquired or leased locations have been operated in compliance with environmental laws and regulations or that future uses or conditions will not result in the imposition of liability upon us under such laws or expose us to third-party actions such as tort suits. Refer to Note 11, “Commitments and Contingencies”, of our Consolidated Financial Statements for further discussion. Our Common Stock trades on the New York Stock Exchange under the symbol “UNF”, while our Class B Common Stock is not publicly traded. The following table sets forth, for the periods indicated, the high and low closing prices of our Common Stock on the New York Stock Exchange, and the dividends per share paid on our Common Stock and Class B Common Stock. The approximate number of shareholders of record of our Common Stock and Class B Common Stock as of October 12, 2018 was 46 and 33, respectively. We believe that the number of beneficial owners of our Common Stock is substantially greater than the number of record holders because a large portion of our Common Stock is held of record in broker “street names”. We have paid regular quarterly dividends since 1983 and intend to continue such policy subject to, among other factors, our earnings, financial condition, capital requirements and tax law changes. No dividends will be payable unless declared by our Board of Directors and then only to the extent funds are legally available for the payment of such dividends. In the event that our Board of Directors votes to pay a dividend, our Common Stock must receive a dividend equal to no less than 125% of any dividend paid on the Class B Common Stock. On March 28, 2018, the Company announced that it would be raising its quarterly dividend to $0.1125 per share for Common Stock and to $0.09 per share for Class B Common Stock, up from $0.0375 and $0.03 per share, respectively. The amount and timing of any dividend payment is subject to the approval of our Board of Directors each quarter. On June 28, 2018, our Board of Directors declared a quarterly dividend of $0.1125 and $0.0900 per share on our Common Stock and Class B Common Stock, respectively, which was paid on September 28, 2018 to shareholders of record on September 7, 2018. The following table sets forth information concerning our equity compensation plans as of August 25, 2018. Includes shares of Common Stock issuable upon vesting of restricted stock units. Restricted stock units are not included in the weighted-average exercise price calculation because there is no exercise price associated with restricted stock units. Set forth below is a line graph comparing the yearly percentage change in the cumulative total shareholder return on our Common Stock, based on the market price of our Common Stock, with the cumulative total shareholder return of a peer group and of companies within the Russell 2000 and the Standard & Poor’s 500 Stock Index, in each case assuming reinvestment of dividends. 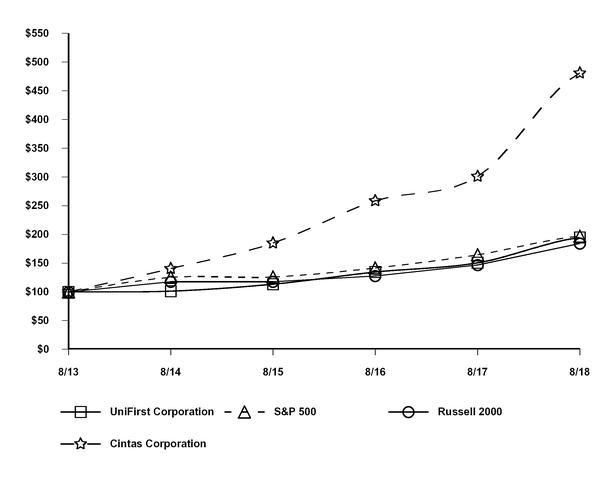 The calculation of cumulative total shareholder return assumes a $100 investment in our Common Stock, Cintas Corporation, the Russel 2000 Index and the S&P 500 Stock Index on August 31, 2013. *$100 invested on 8/31/13 in stock or index, including reinvestment of dividends. Fiscal year ending August 31. Copyright© 2018 Russell Investment Group. All rights reserved. The following selected consolidated financial data should be read in conjunction with our Consolidated Financial Statements and Notes to Consolidated Financial Statements included in Item 8. The selected consolidated balance sheet data set forth below as of August 25, 2018 and August 26, 2017 and the selected consolidated income statement data for each of the three years in the period ended August 25, 2018 are derived from our audited Consolidated Financial Statements included in this Annual Report on Form 10-K. All other selected consolidated financial data set forth below are derived from our audited financial statements not included in this Annual Report on Form 10-K. Current accounting guidance requires the income per share for each class of common stock to be calculated assuming 100% of our earnings are distributed as dividends to each class of common stock based on their respective dividend rights. Our Common Stock has a 25% dividend preference to our Class B Common Stock. The Class B Common Stock, which has ten votes per share as opposed to one vote per share for the Common Stock, is not freely transferable but may be converted at any time on a one-for-one basis into Common Stock at the option of the holder of the Class B Common Stock. Our fiscal 2018 results include the impact of the Tax Cuts and Jobs Act (the “Act”) enacted on December 22, 2017, which resulted in a benefit to the Company’s provision for income taxes of $20.1 million ($1.01 per diluted share) from the remeasurement of deferred tax balances and the one-time transition tax. Our fiscal 2018 results also include a $7.2 million pre-tax one-time cash bonus to our employees so that they may share in the benefits received from the recent U.S. tax reform. Such bonus expense, net of tax, reduced the Company's diluted earnings per share by $0.25 in fiscal 2018. On March 27, 2018, we repurchased 1.105 million shares of Class B Common Stock and 0.073 million shares of Common Stock for a combined $146.0 million in a private transaction with the Croatti family at a per share price of $124.00 which benefited the Company's diluted earnings per share by $0.20 in fiscal 2018. Our fiscal 2017 results included an impairment charge of capitalized costs as part of our ongoing CRM systems project totaling $55.8 million before tax. This loss, net of tax reduced the Company’s diluted earnings per share by $1.68 in fiscal 2017. Our fiscal 2017 results also include a $5.4 million pre-tax compensation expense as a result of the accelerated vesting of certain shares of restricted stock upon the death of the Company’s former Chief Executive Officer, Ronald Croatti during the third quarter of fiscal 2017. This expense, net of tax, reduced the Company’s diluted earnings per share by $0.16. In the fourth fiscal quarter of 2016, operating results benefited from a settlement of environmental litigation that resulted in the Company recording a $15.9 million pre-tax gain. This gain, net of tax, increased the Company’s diluted earnings per share by $0.48. The Company’s fiscal year ends on the last Saturday in August. For financial reporting purposes, all fiscal years presented consisted of 52 weeks. UniFirst Corporation, together with its subsidiaries, hereunder referred to as “we”, “our”, the “Company”, or “UniFirst”, is one of the largest providers of workplace uniforms and protective work wear clothing in the United States. We design, manufacture, personalize, rent, clean, deliver, and sell a wide range of uniforms and protective clothing, including shirts, pants, jackets, coveralls, lab coats, smocks, aprons and specialized protective wear, such as flame resistant and high visibility garments. We also rent and sell industrial wiping products, floor mats, facility service products and other non-garment items, and provide restroom and cleaning supplies and first aid cabinet services and other safety supplies, to a variety of manufacturers, retailers and service companies. We serve businesses of all sizes in numerous industry categories. Typical customers include automobile service centers and dealers, delivery services, food and general merchandise retailers, food processors and service operations, light manufacturers, maintenance facilities, restaurants, service companies, soft and durable goods wholesalers, transportation companies, and others who require employee clothing for image, identification, protection or utility purposes. We also provide our customers with restroom and cleaning supplies, including air fresheners, paper products and hand soaps. At certain specialized facilities, we also decontaminate and clean work clothes and other items that may have been exposed to radioactive materials and service special cleanroom protective wear and facilities. Typical customers for these specialized services include government agencies, research and development laboratories, high technology companies and utilities operating nuclear reactors. We continue to expand into additional geographic markets through acquisitions and organic growth. We currently service over 300,000 customer locations in the United States, Canada and Europe from over 250 customer service, distribution and manufacturing facilities. U.S. GAAP establishes standards for reporting information regarding operating segments in annual financial statements and requires selected information of those segments to be presented in interim financial reports issued to shareholders. Operating segments are identified as components of an enterprise for which separate discrete financial information is available for evaluation by the chief operating decision-maker, or decision-making group, in making decisions on how to allocate resources and assess performance. Our chief operating decision-maker is our Chief Executive Officer. We have six operating segments based on the information reviewed by our Chief Executive Officer: U.S. Rental and Cleaning, Canadian Rental and Cleaning, Manufacturing (“MFG”), Specialty Garments Rental and Cleaning (“Specialty Garments”), First Aid and Corporate. The U.S. Rental and Cleaning and Canadian Rental and Cleaning operating segments have been combined to form the U.S. and Canadian Rental and Cleaning reporting segment. Refer to Note 15, “Segment Reporting”, of our Consolidated Financial Statements for our disclosure of segment information. and Cleaning reporting segment are referred to by us as our ‘industrial laundry operations’ and we refer to the locations related to this reporting segment as our ‘industrial laundries’. The MFG operating segment designs and manufactures uniforms and non-garment items primarily for the purpose of providing these goods to the U.S. and Canadian Rental and Cleaning reporting segment. The amounts reflected as revenues of MFG are primarily generated when goods are shipped from our manufacturing facilities, or subcontract manufacturers, to our other locations. These intercompany revenues are recorded at a transfer price which is typically in excess of the actual manufacturing cost. Products are carried in inventory and subsequently placed in service and amortized at this transfer price. On a consolidated basis, intercompany MFG revenues and MFG income are eliminated and the carrying value of inventories and rental merchandise in service is reduced to the manufacturing cost. Income before income taxes from MFG, net of the intercompany MFG elimination, offsets the merchandise amortization costs incurred by the U.S. and Canadian Rental and Cleaning reporting segment as the merchandise costs of this reporting segment are amortized and recognized based on inventories purchased from MFG at the transfer price which is above our manufacturing cost. The Corporate operating segment consists of costs associated with our distribution center, sales and marketing, information systems, engineering, materials management, manufacturing planning, finance, budgeting, human resources, other general and administrative costs and interest expense. The revenues generated from the Corporate operating segment represent certain direct sales made directly from our distribution center. The products sold by this operating segment are the same products rented and sold by the U.S. and Canadian Rental and Cleaning reporting segment. In the segment disclosures in Note 15, “Segment Reporting”, of our Consolidated Financial Statements, no assets or capital expenditures are presented for the Corporate operating segment as no assets are allocated to this operating segment in the information reviewed by our chief executive officer. However, depreciation and amortization expense related to certain assets are reflected in income from operations and income before income taxes for the Corporate operating segment. The assets that give rise to this depreciation and amortization are included in the total assets of the U.S. and Canadian Rental and Cleaning reporting segment as this is how they are tracked and reviewed by us. We refer to our U.S. and Canadian Rental and Cleaning, MFG, and Corporate segments combined as our “Core Laundry Operations”. The Specialty Garments operating segment purchases, rents, cleans, delivers and sells, specialty garments and non-garment items primarily for nuclear and cleanroom applications and provides cleanroom cleaning services at limited customer locations. The First Aid operating segment sells first aid cabinet services and other safety supplies as well as maintains wholesale distribution and pill packaging operations. Approximately 90% of our revenues in fiscal 2018 were derived from U.S. and Canadian Rental and Cleaning, and Corporate. A key driver of this business is the number of workers employed by our customers. Our revenues are directly impacted by fluctuations in these employment levels. Revenues from Specialty Garments, which accounted for approximately 7% of our 2018 revenues, increase during outages and refueling by nuclear power plants, as garment usage increases at these times. First Aid represented approximately 3% of our total revenue in fiscal 2018. We believe the following critical accounting policies reflect our more significant judgments and estimates used in the preparation of our Consolidated Financial Statements. We prepare our financial statements in conformity with U.S. GAAP, which requires management to make estimates and assumptions that affect the reported amounts in the financial statements and accompanying notes. These estimates are based on historical information, current trends, and information available from other sources. The actual results could differ from our estimates. the period they become known. If the financial condition of our customers were to deteriorate, resulting in an impairment of their ability to make payments, additional allowances may be required. Material changes in our estimates may result in significant differences in the amount and timing of bad debt expense recognition for any given period. Our revenues do not include taxes we collect from our customers and remit to governmental authorities. Our inventories are stated at the lower of cost or market value, net of any reserve for excess and obsolete inventory. Judgments and estimates are used in determining the likelihood that new goods on hand can be sold to our customers or used in our rental operations. Historical inventory usage and current revenue trends are considered in estimating both excess and obsolete inventories. If actual product demand and market conditions are less favorable than the amount we projected, additional inventory write-downs may be required. We use the first-in, first-out (“FIFO”) method to value our inventories, which primarily consist of finished goods. Rental merchandise in service is being amortized on a straight-line basis over the estimated service lives of the merchandise, which range from 6 to 36 months. In establishing estimated lives for merchandise in service, our management considers historical experience and the intended use of the merchandise. Material differences may result in the amount and timing of operating profit for any period if we make significant changes to our estimates. In accordance with U.S. GAAP, we do not amortize goodwill. Instead, we test goodwill at the reporting unit level for impairment on an annual basis and between annual tests if events and circumstances indicate it is more likely than not that the fair value of a reporting unit is less than its carrying value. Our evaluation considers changes in the operating environment, competitive information, market trends, operating performance and cash flow modeling. We complete our annual goodwill impairment test in the fourth quarter of each fiscal year and there have been no impairments of goodwill or other intangible assets in fiscal 2018, 2017 or 2016. We cannot predict future economic conditions and their impact on the Company or the future market value of our stock. A decline in our market capitalization and/or deterioration in general economic conditions could negatively and materially impact our assumptions and assessment of the fair value of our business. If general economic conditions or our financial performance deteriorate, we may be required to record a goodwill impairment charge in the future which could have a material impact on our financial condition and results of operations. Property, plant and equipment, and definite-lived intangible assets are depreciated or amortized over their useful lives. Useful lives are based on our estimates of the period that the assets will generate economic benefits. Long-lived assets are evaluated for impairment whenever events or circumstances indicate an asset may be impaired. There were no material impairments of long-lived assets in fiscal 2018 and 2016. During the fourth quarter of fiscal 2017, the Company recognized a non-cash impairment charge in its U.S. and Canadian Rental and Cleaning segment of $55.8 million on its ongoing CRM systems project, as the Company has now determined that it is no longer probable that the current version of that was being developed will be completed and placed into service. We self-insure for certain obligations related to health, workers’ compensation, vehicles and general liability programs. We also purchase stop-loss insurance policies for workers’ compensation, vehicles and general liability programs to protect ourselves from catastrophic losses. Judgments and estimates are used in determining the potential value associated with reported claims and for events that have occurred, but have not been reported. Our estimates consider historical claim experience and other factors. Our liabilities are based on our estimates, and, while we believe that our accruals are adequate, the ultimate liability may be significantly different from the amounts recorded. In certain cases where partial insurance coverage exists, we must estimate the portion of the liability that will be covered by existing insurance policies to arrive at our net expected liability. Receivables for insurance recoveries are recorded as assets, on an undiscounted basis. Changes in our claim experience, our ability to settle claims or other estimates and judgments we use could have a material impact on the amount and timing of expense for any given period. We are subject to legal proceedings and claims arising from the conduct of our business operations, including environmental matters, personal injury, customer contract matters and employment claims. Accounting principles generally accepted in the United States require that a liability for contingencies be recorded when it is probable that a liability has occurred and the amount of the liability can be reasonably estimated. Significant judgment is required to determine the existence of a liability, as well as the amount to be recorded. We regularly consult with our attorneys and outside consultants, in our consideration of the relevant facts and circumstances, before recording a contingent liability. We record accruals for environmental and other contingencies based on enacted laws, regulatory orders or decrees, our estimates of costs, insurance proceeds, participation by other parties, the timing of payments, and the input of our attorneys and outside consultants. The estimated liability for environmental contingencies has been discounted as of August 25, 2018 using risk-free interest rates ranging from 2.8% to 3.0% over periods ranging from ten to thirty years. The estimated current costs, net of legal settlements with insurance carriers, have been adjusted for the estimated impact of inflation at 3% per year. Changes in enacted laws, regulatory orders or decrees, our estimates of costs, risk-free interest rates, insurance proceeds, participation by other parties, the timing of payments, the input of our attorneys and outside consultants or other factual circumstances could have a material impact on the amounts recorded for our environmental and other contingent liabilities. Refer to Note 11, “Commitments and Contingencies”, of our Consolidated Financial Statements for additional discussion and analysis. Under U.S. GAAP, asset retirement obligations generally apply to legal obligations associated with the retirement of long-lived assets that result from the acquisition, construction, development and/or the normal operation of a long-lived asset. Current accounting guidance requires that we recognize asset retirement obligations in the period in which they are incurred if a reasonable estimate of fair value can be made. The associated asset retirement costs are capitalized as part of the carrying amount of the long-lived asset. We have recognized as a liability the present value of the estimated future costs to decommission our nuclear laundry facilities in accordance with U.S. GAAP. We depreciate, on a straight-line basis, the amount added to property, plant and equipment and recognize accretion expense in connection with the discounted liability over the various remaining lives which range from approximately two to twenty-six years. Our estimated liability has been based on historical experience in decommissioning nuclear laundry facilities, estimated useful lives of the underlying assets, external vendor estimates as to the cost to decommission these assets in the future, and federal and state regulatory requirements. The estimated current costs have been adjusted for the estimated impact of inflation at 3% per year. The liability has been discounted using credit-adjusted risk-free rates that range from approximately 7.0% to 7.5%. Revisions to the liability could occur due to changes in the estimated useful lives of the underlying assets, estimated dates of decommissioning, changes in decommissioning costs, changes in federal or state regulatory guidance on the decommissioning of such facilities, or other changes in estimates. Changes due to revisions in our estimates will be recognized by adjusting the carrying amount of the liability and the related long-lived asset if the assets are still in service, or charged to expense in the period if the assets are no longer in service. We recognize pension expense on an accrual basis over our employees’ estimated service periods. Pension expense is generally independent of funding decisions or requirements. The calculation of pension expense and the corresponding liability requires us to use a number of critical assumptions, including the expected long-term rates of return on plan assets, the assumed discount rate, the assumed rate of compensation increases and life expectancy of participants. Changes in our assumptions can result in different expense and liability amounts, and future actual expense can differ from these assumptions. Pension expense increases as the expected rate of return on pension plan assets decreases. Future changes in plan asset returns, assumed discount rates and various other factors related to the participants in our pension plans will impact our future pension expense and liabilities. We cannot predict with certainty what these factors will be in the future. We compute income tax expense by jurisdiction based on our operations in each jurisdiction. Deferred income taxes are provided for temporary differences between the amounts recognized for income tax and financial reporting purposes at currently enacted tax rates. We are periodically reviewed by U.S. domestic and foreign tax authorities regarding the amount of taxes due. These reviews typically include inquiries regarding the timing and amount of deductions and the allocation of income among various tax jurisdictions. In evaluating our exposure associated with various filing positions, we have recorded estimated reserves. Refer to Note 4, “Income Taxes”, of our Consolidated Financial Statements for further discussion regarding our accounting for income taxes and uncertain tax positions for financial accounting purposes. We have undistributed earnings from our foreign subsidiaries of approximately $129.7 million as of August 25, 2018. We consider these undistributed earnings as indefinitely reinvested and therefore have not provided for U.S. income taxes or foreign withholding taxes. In addition, we have accumulated $49.3 million in cash outside the United States that will be subject to a one-time transition tax as discussed in Note 4 of our Consolidated Financial Statements included in this Annual Report on Form 10-K. This cash is expected to be invested indefinitely in our foreign subsidiaries. If these funds were distributed to the U.S. in the form of dividends, we would likely be subject to additional taxes including withholding taxes from the countries where the cash is currently held. We do not believe that any resulting taxes payable for cash outside the United States would have a material impact on our liquidity. The following table presents certain selected financial data, including the percentage of revenues represented by each item, for fiscal years 2018, 2017 and 2016. (1)Exclusive of depreciation on our property, plant and equipment and amortization of our intangible assets. Revenues and income (loss) from operations by reporting segment for fiscal 2018, 2017, and 2016 are presented in the following table. Refer to Note 15, “Segment Reporting”, of our Consolidated Financial Statements for discussion of our reporting segments. Cost of revenues include the amortization of rental merchandise in service and merchandise costs related to direct sales as well as labor and other production, service and delivery costs, and distribution costs associated with operating our Core Laundry Operations, Specialty Garments facilities, and First Aid locations. Selling and administrative costs include costs related to our sales and marketing functions as well as general and administrative costs associated with our corporate offices, non-operating environmental sites and operating locations including information systems, engineering, materials management, manufacturing planning, finance, budgeting, and human resources. cutbacks by our customers both in, and dependent upon, the oil and natural gas industries, which would outweigh the benefits in our operating costs from lower energy costs. The cost of healthcare that we provide to our employees has grown over the last few years at a rate in excess of our revenue growth and as a result, has negatively impacted our operating results. Moreover, it is generally expected that healthcare costs in the United States will increase over the coming years at rates in excess of inflation. As a result of these factors, and depending on the effect of any modifications we have made, and may make in the future, to our employee healthcare plans and enrollment levels in those plans, we expect that our future operating results will continue to be further adversely impacted by increasing healthcare costs. Our business is subject to various state and federal regulations, including employment laws and regulations, minimum wage requirements, overtime requirements, working condition requirements, citizenship requirements, healthcare insurance mandates and other laws and regulations that impact our labor costs. We expect that our labor costs will rise in fiscal 2019 as a result of increases in state and local minimum wage levels as well as the overall impact of wage pressure as the result of a low unemployment environment. On December 22, 2017, the Tax Cuts and Jobs Act (the “Act”) was enacted, which, among other provisions, reduces the U.S. federal corporate income tax rate effective January 1, 2018 from a 35% rate to a new 21% corporate rate and imposes a one-time transition tax on earnings held outside of the United States. We have made reasonable estimates of the effects of the Act and these estimates could change in future periods as we continue to analyze the effects of the Act (see Note 4, “Income Taxes” to our Consolidated Financial Statements included in this Annual Report on Form 10-K). As a result of the Act, U.S. corporations are subject to lower income tax rates, and we were required to remeasure our U.S. net deferred tax liabilities at a lower rate, resulting in a net benefit of $22.6 million recorded in the provision for income taxes as of August 25, 2018. Partially offsetting this benefit, we recorded a charge of $2.5 million for transition taxes related to the deemed repatriation of foreign earnings as of August 25, 2018. A portion of our sales is derived from international markets, including Canada. Revenues denominated in currencies other than the U.S. dollar represented approximately 8.1%, 7.4% and 7.9% of total consolidated revenues for fiscal years 2018, 2017 and 2016, respectively. The operating results of our international subsidiaries are translated into U.S. dollars and such results are affected by movements in foreign currencies relative to the U.S. dollar. In addition, a weaker Canadian dollar increases the costs to our Canadian operations of merchandise and other operational inputs that are sourced from outside Canada, which has the effect of reducing the operating margins of our Canadian business if we are unable to recover these additional costs through price adjustments with our Canadian customers. In fiscal 2018 and 2016, foreign currency fluctuations impacted our consolidated revenues positively by 0.3% and negatively by 0.8%, respectively. In fiscal 2017, foreign currency fluctuations negligibly impacted our consolidated revenues. These impacts were primarily driven by fluctuations in the Canadian dollar. Our operating results in future years could be negatively impacted by any further devaluation, as compared to the U.S. dollar, of the Canadian dollar or any of the currencies of the other countries in which we operate. On March 27, 2018, we repurchased 1.105 million shares of Class B Common Stock and 0.073 million shares of Common Stock for a combined $146.0 million in a private transaction with the Croatti family at a per share price of $124.00. This opportunity to repurchase shares from the Croatti family was evaluated by an independent special committee of the Board of Directors (the “Special Committee”). The sale of shares by the Croatti family was executed to provide liquidity as well as for estate and family financial planning following the passing of our former Chief Executive Officer, Ronald D. Croatti. The Special Committee determined that a repurchase of Croatti family Class B Common Stock at a discount to market was in our best interests as it is accretive to income per share and addresses uncertainties that may have been created if the Croatti family had pursued other liquidity options. The Special Committee undertook its evaluation with the assistance of Stifel Financial Corp. (“Stifel”) and received an opinion from Stifel to the effect that, as of March 27, 2018, the $124.00 per share in cash to be paid was fair to us, from a financial point of view. The entire Board of Directors other than Cynthia Croatti, who is affiliated with the selling shareholders and therefore abstained, approved the transaction upon the recommendation of the Special Committee. On March 28, 2018, we announced that we would be raising our quarterly dividend to $0.1125 per share for Common Stock and to $0.09 per share for Class B Common Stock, up from $0.0375 and $0.03 per share, respectively. The amount and timing of any dividend payment is subject to the approval of the Board of Directors each quarter. In fiscal 2018, our consolidated revenues increased by $105.5 million from the comparable period in fiscal 2017, or 6.6%. The increase in our consolidated revenues was primarily driven by the growth in our Core Laundry Operations, with revenues increasing to $1.524 billion in fiscal 2018 from $1.442 billion in fiscal 2017, or 5.7%. Excluding the positive effect of acquisitions, which we estimate increased our revenues by approximately 1.0% during the year, as well as a slightly stronger Canadian dollar, which favorably impacted our growth by 0.2%, organic growth for our Core Laundry Operations was 4.5%. Organic growth consists primarily of new sales, price increases, and net changes in the wearer levels at our existing customers, offset by lost accounts. Specialty Garments’ revenue increased from $98.0 million in fiscal 2017 to $118.5 million in fiscal 2018, or 20.9%. This segment’s results are often affected by seasonality and the timing and length of its customers’ power reactor outages as well as its project-based activities. The improvement in results in fiscal 2018 compared to fiscal 2017 was primarily due to increased outages and project-based activity at the segment’s Canadian and European nuclear customers, as well as solid growth from the cleanroom business. First Aid revenues increased 7.0%, from $50.8 million in fiscal 2017 to $54.4 million in fiscal 2018. The improvement in results was due to a strong performance from this segment's wholesale distribution business as well as a small acquisition that closed in the third quarter of fiscal 2017. Cost of revenues was 62.3% and 62.5% of revenues in fiscal 2018 and fiscal 2017, respectively. The decrease was due primarily to lower worker's compensation expense as a percentage of revenues, as well as lower merchandise costs in our Core Laundry and Specialty Garments segments. These cost improvements were partially offset by higher production and service and delivery payroll costs as well as higher energy costs as percentages of revenues in our Core Laundry Operations. Our selling and administrative expenses were 21.3% and 21.5% of revenues in fiscal 2018 and fiscal 2017, respectively. Our results in fiscal 2018 include a $7.2 million one-time cash bonus to our employees so that they may share in the benefits received from the recent U.S. tax reform. Our results in fiscal 2017 include $5.4 million of stock compensation expense related to the accelerated vesting of restricted stock for our former Chief Executive Officer, Ronald Croatti, upon his death. Excluding the effect of the one-time bonus in fiscal 2018 and the accelerated vesting in fiscal 2017, our selling and administrative expenses, as a percentage of revenues for fiscal 2018 as compared to fiscal 2017, decreased due primarily to lower expenses from claims related to healthcare for our employees and worker's compensation. Our fiscal 2017 fourth quarter results included a $55.8 million impairment charge related to our CRM systems project. We determined that as of August 26, 2017, it was not probable that the then current version of the CRM system that was being developed would be completed and placed into service and as a result an impairment of most capitalized costs was required. During fiscal 2018, the previous version of the CRM system being developed was abandoned, and the Company is now working on a new CRM system. Our depreciation and amortization expense was $96.7 million, or 5.7% of revenues, in fiscal 2018 compared to $88.9 million, or 5.6% of revenues, in fiscal 2017. Depreciation and amortization expense increased due primarily to an increase in depreciation resulting from higher capital expenditures placed in service in recent fiscal years. Other income, net, which includes interest expense, interest income and other income and expense, increased by 0.6% in fiscal 2018 as compared to fiscal 2017. This change was primarily due to net interest income of $5.5 million during fiscal 2018 compared to interest income of $4.3 million during fiscal 2017. The increase was offset by a decrease in other expense (income), net, of $1.2 million in fiscal 2018 compared to fiscal 2017 due to a $0.5 million insurance policy gain in the fourth quarter of fiscal 2017 and foreign currency exchange gains. Our effective income tax rate for fiscal 2018 was 12.5% compared to 39.0% for fiscal 2017. The change in our effective tax rate was due primarily to the impact of the Act, which lowered the U.S. federal corporate income tax rates as of January 1, 2018. These new rates required us to remeasure our U.S. net deferred income tax liabilities for fiscal 2018. Also, we will be subject to a one-time transition tax for the deemed repatriation of our foreign earnings. The remeasurement of our U.S. net deferred tax liabilities and the one-time transition tax resulted in a $20.1 million net benefit to our provision for income taxes in fiscal 2018. Our effective tax rate for fiscal 2018 also benefited from the effect of the lower U.S. federal corporate income tax rates on our earnings. In addition to the impact of the Act, our effective tax rate for fiscal 2018 was lower due to a discrete tax benefit of $3.1 million from the adoption of new accounting guidance during the first quarter of fiscal 2018 that requires tax effects of exercised or vested awards to be treated as discrete items as a reduction of income tax expense in the reporting period in which they occur. In fiscal 2017, our consolidated revenues increased by $122.9 million from the comparable period in 2016, or 8.4%. The increase in our consolidated revenues was primarily driven by the growth in our Core Laundry Operations, with revenues increasing to $1.442 billion in 2017 from $1.329 billion in fiscal 2016, or 8.5%. Excluding the positive effect of acquisitions, which we estimated increased our revenues by approximately 5.4% during the year, organic growth for our Core Laundry Operations was 3.1%. The impact on our revenues from acquisitions was primarily the result of our acquisition of Arrow, which was completed on September 19, 2016. Organic growth consists primarily of new sales, price increases, and net changes in the wearer levels at our existing customers, offset by lost accounts. Our organic growth, particularly in the first half of the year was negatively impacted by reductions at our customers that directly or indirectly support oil or other energy production in the United States and Canada. Specialty Garments’ revenue increased from $91.3 million in fiscal 2016 to $98.0 million in fiscal 2017, or 7.4%. This segment’s results can vary significantly from period to period due to seasonality and the timing of nuclear reactor outages and projects. The improvement in results compared to a year ago was driven primarily by increased outage and project-based activity in this segment’s U.S. and Canadian nuclear operations. First Aid revenues increased 7.1%, from $47.4 million in fiscal 2016 to $50.8 million in fiscal 2017. The improvement in the results was due to a strong performance from this segment's wholesale distribution business as well as a small acquisition that closed in the third quarter of fiscal 2017. Cost of revenues increased as a percentage of revenues from 61.3%, or $900.4 million, in fiscal 2016 to 62.5% of revenues, or $993.6 million, in fiscal 2017. The operations related to the Arrow acquisition had costs of revenues during the fiscal year that were significantly higher as a percentage of revenues than the remaining Core Laundry Operations. In addition, our Core Laundry Operations, excluding the new Arrow business, had higher expense from claims related to healthcare for our employees as well as workers' compensation and auto related accidents. Energy costs also increased as a percentage of Core Laundry revenues. These higher costs were partially offset by lower merchandise amortization as a percentage of revenues in fiscal 2017 compared to the prior year period. Our selling and administrative expenses increased to 21.5% of revenues, or $342.4 million in fiscal 2017, from 19.4% of revenues, or $284.8 million in fiscal 2016. This increase was primarily due to the settlement of environmental litigation which resulted in a $15.9 million gain that was recorded in fiscal 2016 as a reduction to selling and administrative expenses. This increase was also the result of a stock compensation expense related to the April 2016 restricted stock grant to our former Chief Executive Officer. A total of $8.8 million was recognized during fiscal 2017 related to this grant, $5.4 million of which was the result of accelerated vesting of certain shares expected to be earned based on the performance of the Company in accordance with the terms of our restricted stock award agreement with our former Chief Executive Officer. In addition, this increase was also driven by higher selling and administrative payroll and payroll related costs, partially the result of investments in our CRM systems project and other technology initiatives. These higher costs were partially offset by lower costs associated with legal and environmental contingencies compared to the prior year period. Our fiscal 2017 fourth quarter results include a $55.8 million impairment charge related to our ongoing CRM systems project. We determined that as of August 26, 2017 it was not probable that the then current version of the CRM system that was being developed would be completed and placed into service and as a result an impairment of most capitalized costs was required. Our depreciation and amortization expense was $88.9 million, or 5.6% of revenues, in fiscal 2017 compared to $81.6 million, or 5.6% of revenues, in fiscal 2016. The increase in depreciation and amortization expense was primarily due to an increase in amortization resulting from the intangible assets acquired from Arrow as well as normal capital expenditure activity in earlier periods. Other income, net which includes interest expense, interest income and other income and expense, was income of $4.8 million for fiscal 2017 as compared to income of $2.2 million for fiscal 2016. This change was primarily due to net interest income of $4.3 million during fiscal 2017 compared to interest income of $2.5 million during fiscal 2016. The increase was also driven by a $0.5 million insurance policy gain in the fourth quarter of fiscal 2017 and foreign currency exchange gains. Our effective tax rate of 39.0% for fiscal 2017 remains relatively consistent with 38.5% for fiscal 2016. Cash, cash equivalents and short-term investments totaled $270.5 million as of August 25, 2018, a decrease of $79.2 million from $349.8 million as of August 26, 2017. Our working capital was $586.3 million as of August 25, 2018 compared to $636.4 million as of August 26, 2017. We generated $230.1 million and $218.3 million in cash from operating activities in the fiscal years ended August 25, 2018 and August 26, 2017, respectively. On March 27, 2018, we repurchased 1.105 million shares of Class B Common Stock and 0.073 million shares of Common Stock for a combined $146.0 million in a private transaction with the Croatti family at a per share price of $124.00. See “Item 7 - Management’s Discussion and Analysis of Financial Condition and Results of Operations” for additional information regarding such repurchase. We believe that our current cash, cash equivalents and short-term investments balances, our cash generated from future operations and amounts available under our Credit Agreement (defined below) will be sufficient to meet our current anticipated working capital and capital expenditure requirements for at least the next 12 months. We have accumulated $49.3 million in cash outside the United States that will be subject to a one-time transition tax as discussed in Note 4 of our Consolidated Financial Statements included in this Annual Report on Form 10-K. This cash is expected to be invested indefinitely in our foreign subsidiaries. If these funds were distributed to the U.S. in the form of dividends, we would likely be subject to additional taxes including withholding taxes from the countries where the cash is currently held. We do not believe that any resulting taxes payable for cash outside the United States would have a material impact on our liquidity. Cash flows provided by operating activities have historically been the primary source of our liquidity. We generally use these cash flows to fund most, if not all, of our operations, capital expenditure and acquisition activities as well as dividends on our Common Stock. We may also use cash flows provided by operating activities, as well as proceeds from loans payable and long-term debt, to fund growth and acquisition opportunities, as well as other cash requirements. Cash provided by operating activities for fiscal 2018 was $230.1 million, an increase of $11.8 million from the prior fiscal year when cash provided by operating activities was $218.3 million. This net increase in cash provided by operating activities was due primarily to higher net income due to an increase in revenue and the impact of the Act. Also contributing to the increase was the timing of tax payments and collections of accounts receivable. These increases were partially offset by the $12.5 million of cash received in September 2016 related to a settlement of environmental litigation we entered into in the fourth quarter of fiscal 2016 and increases in inventories and rental merchandise in service in fiscal 2018 due to the growth in revenue. Cash used in investing activities for fiscal 2018 was $153.9 million, a decrease of $79.1 million from the prior fiscal year when cash used in investing activities was $233.0 million. The net decrease in cash used in investing activities was due primarily to $119.9 million of cash paid in fiscal 2017 in connection with our acquisition of Arrow Uniform in September 2016. Cash used in financing activities for fiscal 2018 was $152.9 million compared to cash used in financing activities of $2.2 million for fiscal 2017. This increase in cash used in financing activities was primarily the result of the repurchase of 1.105 million shares of Class B Common Stock and 0.073 million shares of Common Stock from the Croatti family for $146.0 million, which we completed on March 27, 2018.
outstanding borrowings and had outstanding letters of credit amounting to $63.9 million, leaving $186.1 million available for borrowing under the Credit Agreement. As of August 25, 2018, we were in compliance with all covenants under the Credit Agreement. In January 2015, we entered into sixteen forward contracts to exchange Canadian dollars (“CAD”) for U.S. dollars at fixed exchange rates in order to manage our exposure related to certain forecasted CAD denominated sales of one of our subsidiaries. The hedged transactions are specified as the first amount of CAD denominated revenues invoiced by one of our domestic subsidiaries each fiscal quarter, beginning in the third fiscal quarter of fiscal 2015 and continuing through the second fiscal quarter of the fiscal year ended August 31, 2019 ("fiscal 2019"). In total, we will sell approximately 31.0 million CAD at an average Canadian-dollar exchange rate of 0.7825 over these quarterly periods. We concluded that the forward contracts met the criteria to qualify as a cash flow hedge under U.S. GAAP. Accordingly, we have reflected all changes in the fair value of the forward contracts in accumulated other comprehensive loss, a component of shareholders’ equity. Upon the maturity of each foreign exchange forward contract, the gain or loss on the contract will be recorded as an adjustment to revenues. In June 2018, we entered into twelve forward contracts to exchange CAD for U.S. dollars at fixed exchange rates in order to manage our exposure related to certain forecasted CAD denominated sales of one of our subsidiaries. The hedged transactions are specified as the first amount of CAD denominated revenues invoiced by one of our domestic subsidiaries each fiscal quarter, beginning in the third fiscal quarter of 2019 and continuing through the second fiscal quarter of 2022. In total, we will sell approximately 12.1 million CAD at an average Canadian-dollar exchange rate of 0.7814 over these quarterly periods. We concluded that the forward contracts met the criteria to qualify as a cash flow hedge under U.S. GAAP. As of August 25, 2018, we had forward contracts with a notional value of approximately 14.9 million CAD outstanding and recorded the fair value of the contracts of $0.1 million in other long-term assets and $0.1 million in prepaid expenses and other current assets with a corresponding decrease in accumulated other comprehensive loss of $0.1 million, which was recorded net of tax. During fiscal 2018, we reclassified a nominal amount from accumulated other comprehensive loss to revenue, related to the derivative financial instruments. The gain on these forward contracts that results in decrease to accumulated other comprehensive loss as of August 25, 2018 is expected to be reclassified to revenues prior to its maturity on February 25, 2022. We are subject to various federal, state and local laws and regulations governing, among other things, air emissions, wastewater discharges, and the generation, handling, storage, transportation, treatment and disposal of hazardous wastes and other substances. In particular, industrial laundries currently use and must dispose of detergent waste water and other residues, and, in the past, used perchloroethylene and other dry cleaning solvents. We are attentive to the environmental concerns surrounding the disposal of these materials and have, through the years, taken measures to avoid their improper disposal. Over the years, we have settled, or contributed to the settlement of, actions or claims brought against us relating to the disposal of hazardous materials and there can be no assurance that we will not have to expend material amounts to remediate the consequences of any such disposal in the future. U.S. GAAP requires that a liability for contingencies be recorded when it is probable that a liability has been incurred and the amount of the liability can be reasonably estimated. Significant judgment is required to determine the existence of a liability, as well as the amount to be recorded. We regularly consult with attorneys and outside consultants in our consideration of the relevant facts and circumstances before recording a contingent liability. Changes in enacted laws, regulatory orders or decrees, our estimates of costs, risk-free interest rates, insurance proceeds, participation by other parties, the timing of payments, the input of our attorneys and outside consultants or other factual circumstances could have a material impact on the amounts recorded for our environmental and other contingent liabilities. Springfield, Massachusetts, Uvalde, Texas, Stockton, California, two sites related to former operations in Williamstown, Vermont, as well as sites located in Goldsboro, North Carolina, Wilmington, North Carolina, and Landover, Maryland. We have accrued certain costs related to the sites described above as it has been determined that the costs are probable and can be reasonably estimated. We have potential exposure related to a parcel of land (the “Central Area”) related to the Woburn, Massachusetts site mentioned above. Currently, the consent decree for the Woburn site does not define or require any remediation work in the Central Area. The United States Environmental Protection Agency (the “EPA”) has provided us and other signatories to the consent decree with comments on the design and implementation of groundwater and soil remedies at the Woburn site and investigation of environmental conditions in the Central Area. We, and other signatories, have implemented and proposed to do additional work at the Woburn site but many of the EPA’s comments remain to be resolved. We have accrued costs to perform certain work responsive to EPA’s comments. We have implemented mitigation measures and continue to monitor environmental conditions at the Somerville, Massachusetts site. In addition, we have received demands from the local transit authority for reimbursement of certain costs associated with its construction of a new municipal transit station in the area of the Somerville site. This station is part of a planned extension of the transit system. We have reserved for costs in connection with this matter; however, in light of the uncertainties associated with this matter, these costs and the related reserve may change. We have also received notice that the Massachusetts Department of Environmental Protection is conducting an audit of the Company’s investigation and remediation work with respect to the Somerville site. •The typical allocation of costs among PRPs. There is usually a range of reasonable estimates of the costs associated with each site. In accordance with U.S. GAAP, our accruals represent the amount within the range that we believe is the best estimate or the low end of a range of estimates if no point within the range is a better estimate. When we believe that both the amount of a particular liability and the timing of the payments are reliably determinable, we adjust the cost in current dollars using a rate of 3% for inflation until the time of expected payment and discount the cost to present value using current risk-free interest rates. As of August 25, 2018, the risk-free interest rates we utilized ranged from 2.8% to 3.0%. Anticipated payments and insurance proceeds of currently identified environmental remediation liabilities as of August 25, 2018 for the next five fiscal years and thereafter, as measured in current dollars, are reflected below (in thousands). Estimated insurance proceeds are primarily received from an annuity received as part of our legal settlement with an insurance company. Annual proceeds of approximately $0.3 million are deposited into an escrow account which funds remediation and monitoring costs for two sites related to our former operations in Williamstown, Vermont. Annual proceeds received but not expended in the current year accumulate in this account and may be used in future years for costs related to this site through the year 2027. As of August 25, 2018, the balance in this escrow account, which is held in a trust and is not recorded in our Consolidated Balance Sheet, was approximately $3.9 million. Also included in estimated insurance proceeds are amounts we are entitled to receive pursuant to legal settlements as reimbursements from three insurance companies for estimated costs at the site in Uvalde, Texas. Our nuclear garment decontamination facilities are licensed by the Nuclear Regulatory Commission (“NRC”), or, in certain cases, by the applicable state agency, and are subject to regulation by federal, state and local authorities. We also have nuclear garment decontamination facilities in the United Kingdom and the Netherlands. These facilities are licensed and regulated by the respective country’s applicable federal agency. There can be no assurance that such regulation will not lead to material disruptions in our garment decontamination business. From time to time, we are also subject to legal proceedings and claims arising from the conduct of our business operations, including personal injury claims, customer contract matters, employment claims and environmental matters as described above. While it is impossible for us to ascertain the ultimate legal and financial liability with respect to contingent liabilities, including lawsuits and environmental contingencies, we believe that the aggregate amount of such liabilities, if any, in excess of amounts covered by insurance have been properly accrued in accordance with accounting principles generally accepted in the United States. It is possible, however, that the future financial position and/or results of operations for any particular future period could be materially affected by changes in our assumptions or strategies related to these contingencies or changes out of our control. As part of our business, we regularly evaluate opportunities to acquire other garment service companies. In recent years, we have typically paid for acquisitions with cash and may continue to do so in the future. To pay for an acquisition, we may use cash on hand, cash generated from operations or borrowings under our Credit Agreement, or we may pursue other forms of debt financing. Our ability to secure short-term and long-term debt financing in the future will depend on several factors, including our future profitability, our levels of debt and equity, and the overall credit and equity market environments. The following information is presented as of August 25, 2018 (in thousands). We have uncertain tax positions that are reserved totaling $2.2 million as of August 25, 2018 that are excluded from the above table as we cannot make a reasonably reliable estimate of the period of cash settlement with the respective taxing authority. We have accrued $25.5 million in costs related to certain environmental obligations we have to address under terms of consent orders negotiated with the applicable environmental authorities or otherwise. Refer to “Environmental and Legal Contingencies”, above for additional discussion on our environmental obligations. As discussed above under “Long-Term Debt and Borrowing Capacity”, as of August 25, 2018, we had borrowing capacity of $250.0 million under our Credit Agreement, of which approximately $186.1 million was available for borrowing. Also, as of such date, we had no outstanding borrowings and letters of credit outstanding of $63.9 million. All letters of credit expire in less than one year. We expect to replace the Credit Agreement prior to its maturity with a new revolving line of credit on appropriate terms. As discussed above under “Derivative Instruments and Hedging Activities”, as of August 25, 2018, we had forward contracts with a notional value of approximately 14.9 million CAD outstanding and recorded the fair value of the contracts of $0.1 million in other long-term assets and $0.1 million in prepaid expenses and other current assets with a corresponding decrease in accumulated other comprehensive loss of $0.1 million, which was recorded net of tax. During fiscal 2018, we reclassified a nominal amount from accumulated other comprehensive loss to revenue, related to the derivative financial instruments. The gain on these forward contracts that results in decrease to accumulated other comprehensive loss as of August 25, 2018 is expected to be reclassified to revenues prior to its maturity on February 25, 2022. As of August 25, 2018, we did not have any off balance sheet arrangements, as defined in Item 303(a)(4)(ii) of Securities and Exchange Commission Regulation S-K. Historically, our revenues and operating results have varied from quarter to quarter and are expected to continue to fluctuate in the future. These fluctuations have been due to a number of factors, including: general economic conditions in our markets; the timing of acquisitions and of commencing start-up operations and related costs; our effectiveness in integrating acquired businesses and start-up operations; the timing of nuclear plant outages; capital expenditures; seasonal rental and purchasing patterns of our customers; and price changes in response to competitive factors. In addition, our operating results historically have been lower during the second and fourth fiscal quarters than during the other quarters of the fiscal year. The operating results for any historical quarter are not necessarily indicative of the results to be expected for an entire fiscal year or any other interim periods. customer agreements that generally provide for price increases consistent with the rate of inflation, and continued focus on improvements of operational productivity. Significant increases in energy costs, specifically with respect to natural gas and gasoline, can materially affect our operating costs. During fiscal 2018, our energy costs, which include fuel, natural gas, and electricity, represented approximately 4.1% of our total revenue. In May 2014, the Financial Accounting Standards Board ("FASB") issued updated accounting guidance for revenue recognition, which they have subsequently modified. This modified update provides a comprehensive new revenue recognition model that requires revenue to be recognized in a manner to depict the transfer of goods or services to a customer at an amount that reflects the consideration expected to be received in exchange for those goods or services. The standard includes cost guidance, whereby all direct and incremental costs to obtain or fulfill a contract will be capitalized and amortized over the corresponding period of benefit, determined on a contract by contract basis. This guidance is also intended to improve disclosure requirements and enhance the comparability of revenue recognition practices. Improved disclosures under the amended guidance relate to the nature, amount, timing and uncertainty of revenue that is recognized from contracts with customers. We adopted the standard on August 26, 2018 using the modified retrospective adoption method. The adoption of this guidance is not expected to have a material impact on revenue. In addition to the new qualitative and quantitative disclosures that will be required upon adoption of this standard, we anticipate recognizing a cumulative effect adjustment related to the capitalization of certain direct and incremental contract costs. We estimate the cumulative effect adjustment to be an increase to retained earnings as of August 26, 2018 in the range of approximately $35.0 million to $42.0 million. In July 2015, the FASB issued updated guidance which changes the measurement principle for inventory from the lower of cost or market to the lower of cost or net realizable value. Subsequent measurement is unchanged for inventory measured using last-in, first-out or the retail inventory method. This guidance is effective for annual periods, and interim periods within those annual periods, beginning after December 15, 2016, and is to be applied prospectively, with early adoption permitted. Accordingly, we adopted this standard on August 27, 2017. The adoption of this guidance did not have a material impact on our financial statements. In January 2016, the FASB issued updated guidance for the recognition, measurement, presentation, and disclosure of certain financial assets and liabilities. This guidance is effective for annual periods, and interim periods within those annual periods, beginning after December 15, 2017, with early adoption permitted. Accordingly, the standard will be effective for us on August 26, 2018. We expect that adoption of this guidance will not have a material impact on our financial statements. In February 2016, the FASB issued updated guidance that improves transparency and comparability among companies by recognizing lease assets and lease liabilities on the balance sheet and by disclosing key information about leasing arrangements. This guidance is effective for annual periods, and interim periods within those annual periods, beginning after December 15, 2018, with early adoption permitted. Accordingly, the standard will be effective for us on September 1, 2019. At August 25, 2018, we are contractually obligated to make future payments of $47.1 million under our operating lease obligations in existence as of that date, primarily related to long-term leases. While we are in the early stages of our implementation process of this guidance, and have not yet determined its impact on our consolidated balance sheet or consolidated statement of income, these leases would potentially be required to be presented on the consolidated balance sheet in accordance with the requirements of this guidance. In March 2016, the FASB issued updated guidance that simplifies several aspects of accounting for share-based payment transactions. This guidance is effective for annual periods, and interim periods within those annual periods, beginning after December 15, 2016 and, depending on the amendment, must be applied using a prospective transition method, retrospective transition method, modified retrospective transition method, prospectively and/or retroactively, with early adoption permitted. Accordingly, we adopted this standard on August 27, 2017. The impact of the adoption on the consolidated balance sheet as of August 25, 2018 was a cumulative-effect adjustment of $0.7 million, decreasing retained earnings and increasing capital surplus. The impact of the adoption on the consolidated statement of income was a decrease of $3.1 million in the provision for income taxes during the fiscal year ended August 25, 2018. As a result of the adoption of the updated guidance, our excess tax benefit is no longer included in our calculation of diluted shares under the treasury stock method, resulting in an increase of a nominal amount of shares in the effect of dilutive securities for the fiscal year ended August 25, 2018. The election to recognize forfeitures of share-based awards as they occur resulted in an increase of $0.5 million in share-based compensation for the fiscal year ended August 25, 2018. Prior periods have not been adjusted. In August 2016, the FASB issued updated guidance that reduces diversity in how certain cash receipts and cash payments are presented and classified in the Consolidated Statements of Cash Flows. This guidance will be effective for annual reporting periods, and any interim periods within those annual periods, that begin after December 15, 2017 and will be required to be applied retrospectively, with early adoption permitted. Accordingly, the standard will be effective for us on August 26, 2018. We are currently evaluating the impact that this guidance will have on our financial statements and related disclosures. In October 2016, the FASB issued updated guidance to improve the accounting for the income tax consequences of intra-entity transfers of assets other than inventory. This guidance will be effective for annual reporting periods, and any interim periods within those annual periods, that begin after December 15, 2017 and will be required to be applied on a modified retrospective basis, with early adoption permitted. Accordingly, the standard will be effective for us on August 26, 2018. We are currently evaluating the impact that this guidance will have on our financial statements and related disclosures. In August 2017, the FASB issued guidance that expands component and fair value hedging, specifies the presentation of the effects of hedging instruments, and eliminates the separate measurement and presentation of hedge ineffectiveness. The accounting update is effective for annual and interim periods beginning after December 15, 2018, with early adoption permitted, and is to be applied on a modified retrospective basis. Accordingly, this guidance will be effective for us on September 1, 2019. We are currently evaluating the impact that this guidance will have on our financial statements and related disclosures. In February 2018, the FASB issued guidance that allows a reclassification from Accumulated Other Comprehensive Income to retained earnings for tax effects resulting from the Tax Cuts and Jobs Act (the “Act”) and requires certain new disclosures. This guidance will be effective for us for fiscal years beginning after December 15, 2018, with early adoption permitted. The update should be applied either in the period of adoption or retrospectively to each period in which the effect of the change in the U.S. federal corporate income tax rate in the Act is recognized. We elected to early adopt this guidance in the second quarter of fiscal 2018. The effect of the adoption of the standard was a decrease in accumulated other comprehensive loss of $1.2 million with the offset to retained earnings as recorded in our consolidated balance sheet and statement of changes in stockholders’ equity as of and for the fiscal year ended August 25, 2018. In June 2018, the FASB issued guidance that includes all share-based payment transactions for acquiring goods and services from nonemployees. This guidance is effective for fiscal years beginning after December 15, 2018, including interim periods within that fiscal year, with early adoption permitted. Accordingly, this guidance will be effective for us on September 1, 2019. We are currently evaluating the impact that this guidance will have on our financial statements and related disclosures. In August 2018, the FASB issued updated guidance to modify the disclosure requirements for employers that sponsor defined benefit pension or other postretirement plans. This guidance will be effective for annual reporting periods, and any interim periods within those annual periods, ending after December 15, 2020 and will be required to be applied on a retrospective basis, with early adoption permitted. Accordingly, the standard will be effective for us on August 30, 2020. We are currently evaluating the impact that this guidance will have on our financial statements and related disclosures. We have determined that all of our foreign subsidiaries operate primarily in local currencies that represent the functional currencies of such subsidiaries. All assets and liabilities of our foreign subsidiaries are translated into U.S. dollars using the exchange rate prevailing at the balance sheet date. The effects of exchange rate fluctuations on the translation of assets and liabilities are recorded as a component of shareholders’ equity. Revenues and expenses are translated at the average exchange rates in effect during each month of the fiscal year. As such, our financial condition and operating results are affected by fluctuations in the value of the U.S. dollar as compared to currencies in foreign countries. Revenues denominated in currencies other than the U.S. dollar represented approximately 8.1%, 7.4% and 7.9% of our total consolidated revenues for fiscal 2018, 2017 and 2016, respectively. Total assets denominated in currencies other than the U.S. dollar represented approximately 8.0% and 8.2% of our total consolidated assets at August 25, 2018 and August 26, 2017, respectively. If exchange rates had increased or decreased by 10% from the actual rates in effect during the fiscal year ended August 25, 2018, our revenues and assets for the year ended and as of August 25, 2018 would have increased or decreased by approximately $13.7 million and $14.7 million, respectively. In January 2015, we entered into sixteen forward contracts to exchange Canadian dollars (“CAD”) for U.S. dollars at fixed exchange rates in order to manage our exposure related to certain forecasted CAD denominated sales of one of our subsidiaries. The hedged transactions are specified as the first amount of CAD denominated revenues invoiced by one of our domestic subsidiaries each fiscal quarter, beginning in the third quarter of fiscal 2015 and continuing through the second quarter of fiscal 2019. In total, we will sell approximately 31.0 million CAD at an average Canadian-dollar exchange rate of 0.7825 over these quarterly periods. We concluded that the forward contracts met the criteria to qualify as a cash flow hedge under U.S. GAAP. Accordingly, we have reflected all changes in the fair value of the forward contracts in accumulated other comprehensive loss, a component of shareholders’ equity. Upon the maturity of each foreign exchange forward contract, the gain or loss on the contract will be recorded as an adjustment to revenues. Other than the forward contracts discussed above, we do not operate a hedging program to mitigate the effect of a significant change in the value of the functional currencies of our foreign subsidiaries, which include the Canadian dollar, euro, British pound, Mexican peso and Nicaraguan cordoba, as compared to the U.S. dollar. Any losses or gains resulting from unhedged foreign currency transactions, including exchange rate fluctuations on intercompany accounts are reported as transaction losses (gains) in our other (income) expense. The intercompany payables and receivables are denominated in Canadian dollars, euros, British pounds, Mexican pesos and Nicaraguan cordobas. During the fiscal year ended August 25, 2018, transaction losses included in other expense (income), net, was $0.7 million. If exchange rates had changed by 10% during fiscal 2018, we would have recognized exchange gains or losses of approximately $1.1 million. (1)Exclusive of depreciation on the Company’s property, plant and equipment and amortization of its intangible assets.